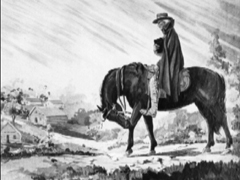 A story is told of a Gospel minister, long before the days of railroads, who was traveling on horseback from Philadelphia to Pittsburg. He stopped over night at a tavern among the mountains of Pennsylvania, and after supper asked the landlord some questions about the people, and whether they ever had preaching there. He was told that there was no church, and no attempt at holding services. The minister told him to prepare a room and invite in the neighbors and he would preach to them. "That would be of no use," said the landlord, "for they would not come." To all such objections the minister had but one answer: "Get the room ready." This was finally done, and, sure enough, as the man had said, nobody came. The good minister was still concerned only to do his part. He waited awhile, then began the service, gave out a hymn, sang, read the Scriptures, prayed, and then gave out the text. Just then a man slipped in and hid himself behind the door, where he stayed all through the sermon which followed, rushing out the minute it ended. Nearly two years afterward the minister went through the place again, and, stopping at the same house, he proposed once more that the landlord should find a room and get it ready, and invite the people in for preaching. "O," said the man, "there will be no trouble now. We have a church, and as soon as I let the people know that you are here it will be filled." It came out a little later that this church of fifty members had been the direct fruit of that night's preaching to the man behind the door. He had been converted, and had been the means of conversion to many of his neighbors. All this from "getting the room ready." Dear Lord we pray that we would trust you fully; knowing that you will use what we give you and You will bless it and multiply it. In Jesus’ name, Amen.